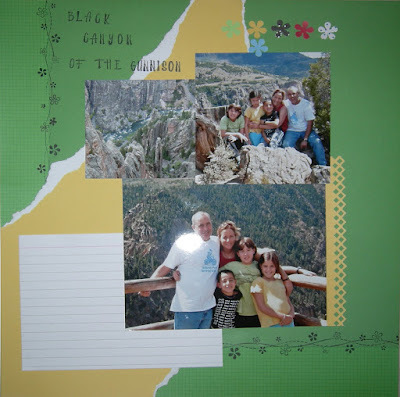 My SIL's family in the Black Canyon - National Park, Colorado. I used: Sonburn cardstocks, Hero Arts Wavy Pinwheels wood stamp, Studio G clear alpha stamps, Fiskars Diamonds Border Punch, flower punch, Stazon Ink. I subsribed to Creating Keepsakes magazine last month. I got August 2009 issue a few days ago and I saw a loyout that caught my eyes: Snippest to San Francisco, by Maggie Holmes (on page 68). Oren (my husband) and I were in a short vacation on May - we went to Prague for a weekend. We haven't been together outside of Israel since our honeymoon, on August 2001. I recently printed many pictures of my family (mostly my daughters) and my SIL's family, so theres was a chance to scrapbook our vacation. I used: Sonburn cardstock, DCWV patterened paper, Journaling Blocks Clear Stamps by Scrappy Cat, Designer Flourishes Clear Stamps by Scrappy Cat, Grosgrain ribbons, Fiskars threading water punch, Cuttlebug Harmony Alphabet (on foam), couple of buttons. I attached the boarding tickets and one of the transportaion ticket we bought.